The magnum opus entitled: “The Law Relating to Debt Recovery (Special Provisions) Act No. 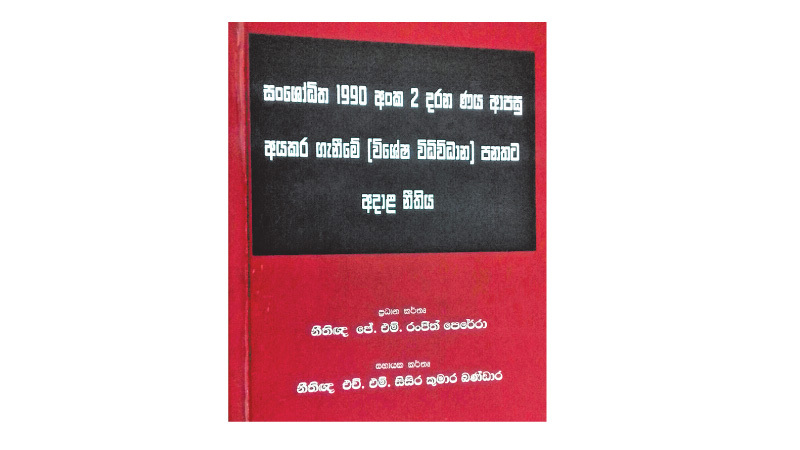 2 of 1990 as amended” (Sanshoditha 1990 Anka 2 Darana Naya Apasu Ayakaragenimé (visheshá vidividanã) panathata adala neethiya) written by Senior Counsel J. M. Ranjith Perera Attorney-at-Law assisted by H. M. Sisira Kumara Bandara Attorney-at-Law was released recently. This opus is indeed a rare invaluable addition to the legal literature of Sri Lanka. Though the law relating to the Debt Recovery was introduced to us well over two decades ago apparently it is widely considered that it contains merits and demerits in our law. It was way back in the year of 1938 that first book of the law in the Sinhalese language emerged entitled: ‘My Lawyer’ (Magé Neethgnayâ) written by B. J. Fernando a then Proctor of the Supreme Court of Ceylon. This book ran into several editions; in 1939 the second edition, the third edition in 1950 revised fourth edition was done by his wife Lakshmi Fernando a Proctor of the S.C. with a forward written by Dr Colvin R. de Silva, that eminent Advocate of the day. The book is now unheard and unknown apparently buried in the whirligig of time. However, this was not the first occasion that law was made known to the public in the Sinhalese language. Advocate Herbert Sri Nissanka later King’s Counsel pioneered in releasing a Sinhalese journal entitled: Raja Niti (Raja Neethi) in 1925 where extracts of some of the statutes were translated into the Sinhalese language. There was phrase coined in the legal area as “like Silindhu” that in the double murder committed by villager Silindhu aptly based on the Bloomsbury group English novel “Beddegama” by Leonard Woolf, that well known Colonial Civil Servant, stood at the Defendants dock mum, were unable to understand the happening of the Court of Law where he was unaware of the procedure that he was sentenced to death. Though the Extraordinary Gazette bearing No. 1/6 dated 07th September 1978 it was allowed the use of English Language to maintain any record and conduct in any court of law in the country. The books on Sinhalese and Tamil languages have since Sri Lanka was made a Republic it became a sine qua non in our original courts of law. The reviewer finds a large amount of Sinhalese law books are released day by day. Some of these books are written by Attorneys-at-Law and laymen alike. But how many of these books are written by legal practitioners. This reviewer is of the fervent opinion that most of these books are mere compendiums. How many of these could make an impact towards the legal system of the country? J. M. Ranjith Perera a Senior Counsel – a busy eminent practitioner in law ably assisted by H. M. Sisira Kumar Bandara Attorney-at-Law has filled the void that hitherto existed on one of the most abstruse parts of civil law namely the Law Relating to Debt Recovery (Special Provisions) No. 2 of 1990 as amended. His path-breaking opus is not a mere book it is an eminent commentary/ study on the subject. The reviewer read and re-read this indispensable book, found replete with thirty-six reported and unreported judgements pronounced by the Superior Courts with an easy reference index guide culled with pertinent extracts of the Sinhalese statute and more appropriately from the English statute. The book spans 191 pages of pure bliss for the legal practitioner. The books contain the extract from Hansard of the Parliament which the intention of the legislature is found and where there were hue and outcry from the members of the Parliament introducing this statute was a draconian piece of legislation. Senior Counsel A. M. Ranjith Perera’s treatise on ‘Law Relating to Debt Recovery Act No. 2 of 1990 as Amended’ has trailed the blaze by his maiden book in not only educating the layman, law students and further for the busy legal practitioners, this reviewer advocates that the book would be an essential guide. Undoubtedly this book would serve as a vade mecum for all these wide arrays of readership.